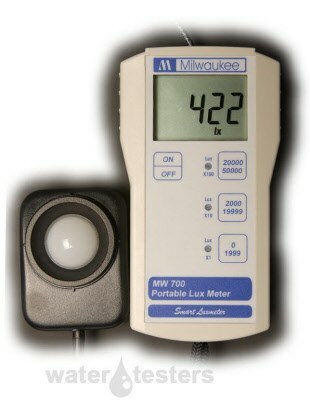 The Milwaukee MW700 is a portable Lux meter designed to perform light measurements. It is supplied with a light sensor connected to the meter that measures from 0 to 50000 Lux. Average indoor lighting ranges from 100 to 1000 Lux and average outdoor sun lights about 50000 Lux. Lux is a unit that indicates the density of light that falls on a surface.